Baltimore, a city of more than half a million residents, has recently proposed an all out vape juice flavor ban. If the Baltimore flavor ban passes, vape shops will have to remove all flavored liquids from their shelves, and vapers will be forced to purchase e-juice elsewhere. 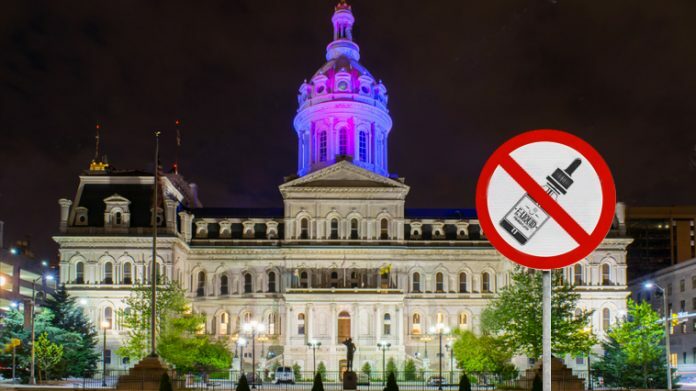 Baltimore City council members proposed a nasty legislative package with hopes of curbing vaping and smoking in the area. The movement consisted of three separate bills, looking to both broaden the definition of a smoking device and push a vaping ban according to a recent Baltimore Sun article. If passed, tobacco retailers would be forced to inform users of the risks of smoking and cessation (which is a good thing! ), and carry nicotine replacement therapy products including patches and gum. Board members worked with the Baltimore City health department for the last year to create these bills. The counsel wanted a solid list of regulations that would give them the most “bang for their buck”. This included making tobacco products harder to get, and easier to quit (sounds good right?). The health departments legislative director D’Paul Nibber claimed that the primary goal was to get existing smokers to seriously think about quitting. At the same time, the legislation would look to ban one of the most successful non-traditional means of smoking cessation: vaping. Anyone considering vaping as an option, including those who had already started using e-cigarettes, would be forced to utilize highly ineffective means of smoking cessation. Counsel members also commented on the youth vaping attitudes, stating that users 18 and under often did not consider vape pens as a means of quitting, but rather a harmless activity to take part in. The appeal flavored e-liquids has on young users is cloudy at best, as case specific research has never been completed on the topic. Apparently, backing such statements through scientific study is of little importance to Baltimore City, as they plan to ban flavors on the bases of a general consensus. And there’s no telling how such a ban would effect Baltimore’s economy. As it stands currently, the bills would include nearly every single flavor on the market today; including: fruit, chocolate, vanilla, honey, candy, herbs and spices. Anyone who vapes knows that these flavor profiles account for 99% of the liquids on the shelf at every vape shop. It is unclear how flavored tobacco products would be covered in the ban. Looking to align themselves with current FDA regulation, legislation would broaden its coverage to include any battery operated product that could be used to deliver nicotine or any other substance intended for human consumption – also known as every single vape product available on the market today. Alternative battery operated products would stand to be affected as well, which could spell disaster for many. The entire basis of the Baltimore flavor ban all seems a bit forced. There’s very little science, if any, on the effectiveness of flavor/vape bans similar to the lack of case-specific studies on the effects of long term vaping. Baltimore is not the first city to take a whack at passing tough e-cig regulations; it seems like there’s a new county looking to push their anti-ecig agenda every day. How would current smokers, and those looking to quit be affected if this Baltimore flavor ban passes? Instead of having access to non-traditional harm reduction products like e-cigs, the patch and gum would be the available cessation products. Since traditional means of quitting are largely ineffective, most users would likely turn to back to cigarettes to get their nicotine fix. Vapor products would no longer be an option for youth members of the community either, which would make cigarettes and smokeless tobacco products (maybe flavored, maybe not) the only option. If a community where highly addictive cancer causing cigarettes, and cessation products made by the same big tobacco companies are the only products available to you sounds like something you’d be interested in, by all means move to Baltimore! Want more news? Be sure to check out our News page! Did the DEA Just Secretly Legalize CBD? The “Real Cost” of New FDA Campaign? Credibility.